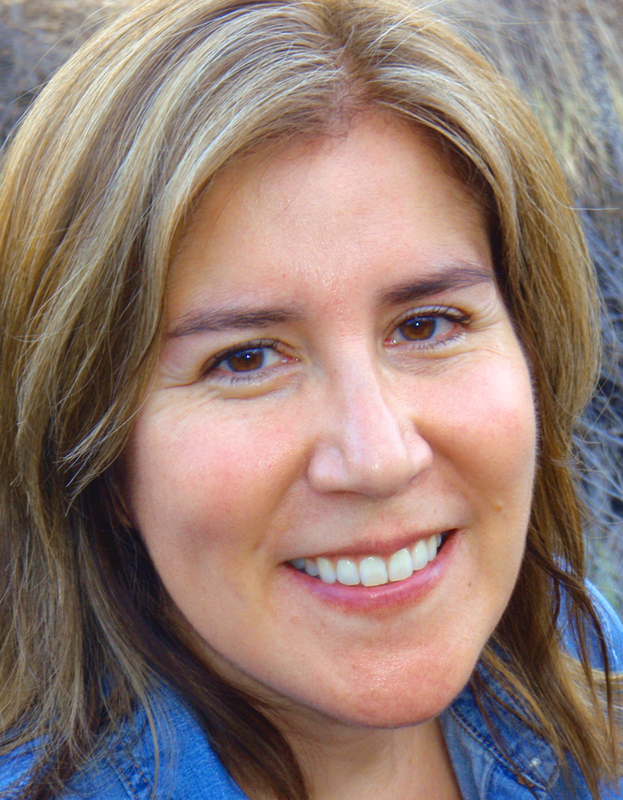 SCVHistory.com | Mojave Desert | Finding Fossil Falls in the Coso Range | By Linda Castro, 2015. SCVNews.com | August 27, 2015. 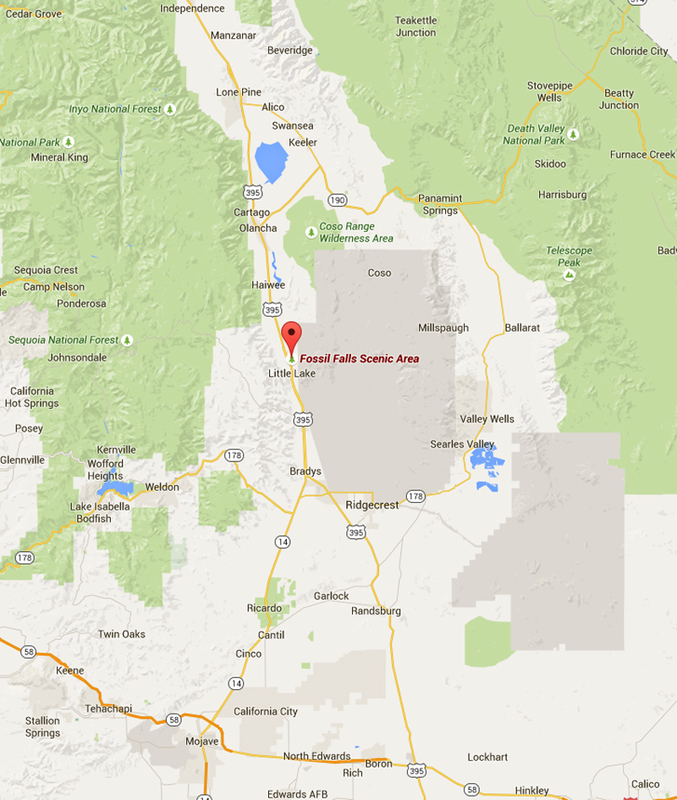 While driving on Highway 395 between Pearsonville and Coso Junction, you may have noticed a small sign that marks a road to Fossil Falls. The name is somewhat deceiving; you will not see a waterfall at Fossil Falls. However, Fossil Falls is a unique and scenic place that is worth the short side trip. Not only does the area offer spectacular scenery, but it also provides interesting geologic formations and a window to the past – to the indigenous people who once lived in the area. 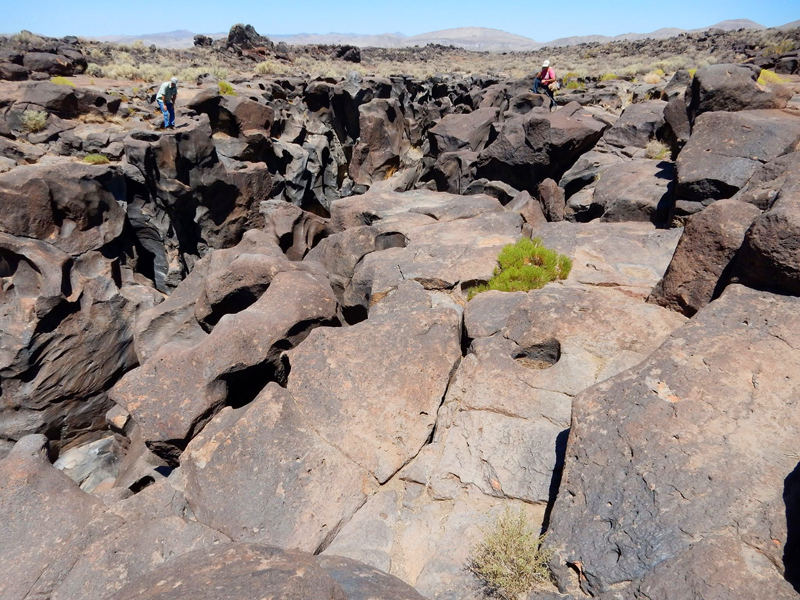 The landscape in and around Fossil Falls was created by periods of volcanism going back about 440,000 years. The nearby Coso Range erupted many times, filling the area with thick, dark lava. During the rains and snows of the last Ice Age, which began a little less than 2 million years ago, large lakes formed in many of the basins in the Owens Valley and Death Valley. During that time, the Owens River flowed south out of Owens Lake and down through the narrow valley between the Sierra Nevada and Coso Range. The eruptions from the Coso Range changed the course of the Owens River at least three times by pouring into the Owens River channel. Fossil Falls were formed when the Owens River was dammed by an eruption. 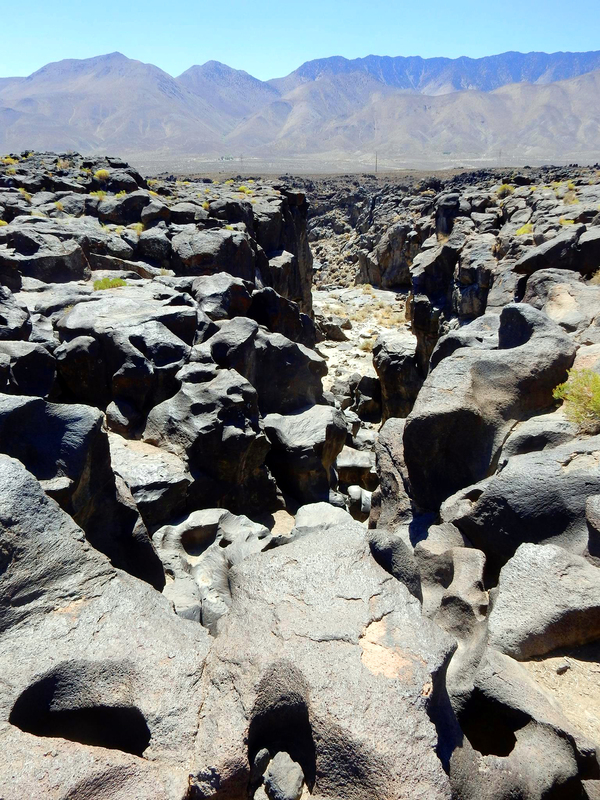 As recently as 20,000 years ago, when the Owens River had sufficient water, it would overflow the lava dam, which then sculpted and polished the lava rock into the formations you will see today. About 10,000 to 20,000 years ago, the Fossil Falls area teemed with life. The first humans camped along the rivers and lakes of what is now the Mojave Desert. As the climate shifted to extremely dry conditions, prehistoric populations moved to higher elevations. Evidence suggests that humans returned to the area about 4000 B.C., when the climate became more moderate. These people were hunter-gatherers and led nomadic lives. They were able to live in this desert environment by taking full advantage of the wide variety of desert plant foods, as well as small and large mammals, reptiles, birds and insects that lived in the area. If you look at the rocks and boulders at Fossil Falls, you will see some smooth basins in some of them. Over time, basins such as these were created by the grinding of seeds on the large rocks, with handheld rocks. The area also gave the indigenous people an important raw material needed to make stone tools: obsidian (volcanic glass). Obsidian was used to make tools such as projectile points, knives and scrapers. 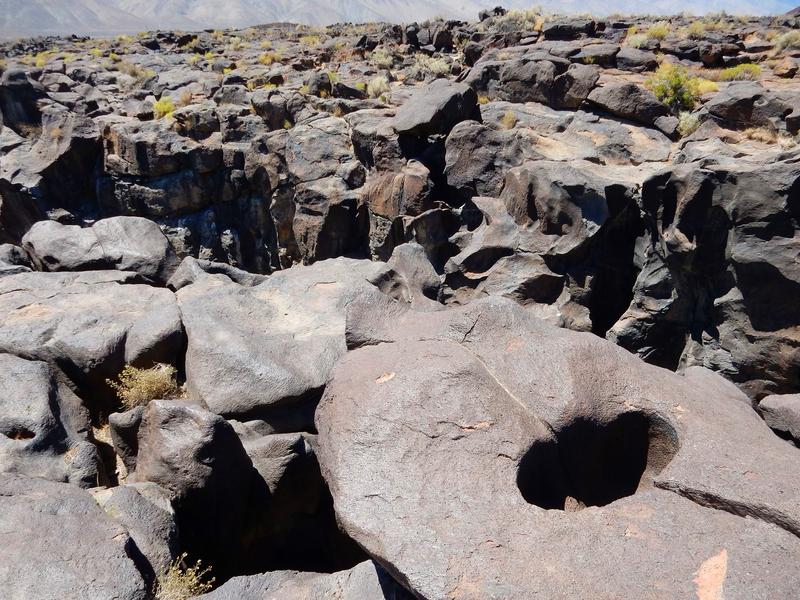 Take a close look around Fossil Falls and you will see large scatters of obsidian waste flakes which are the byproducts of stone tool manufacture. When you visit Fossil Falls, you might notice that the area is managed by the Bureau of Land Management. 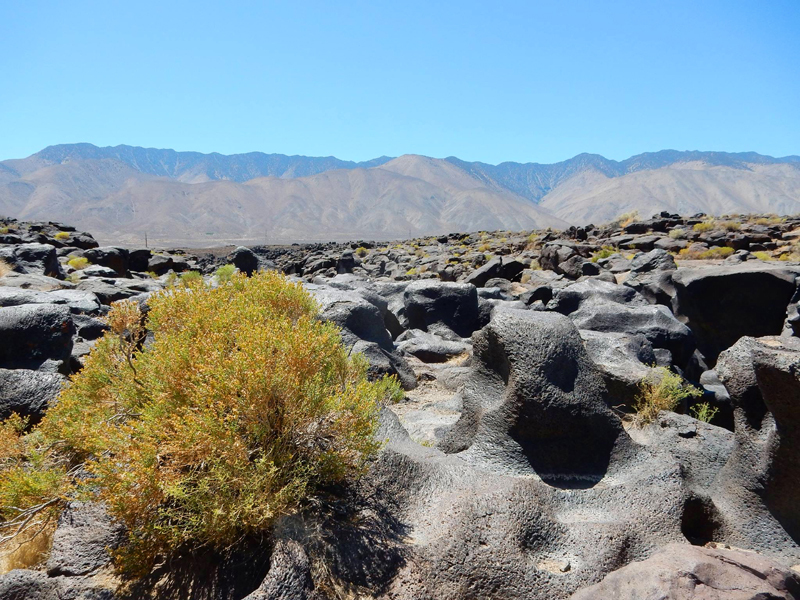 The BLM recently proposed to designate Fossil Falls a National Conservation Land. Currently, the National Conservation Lands designation recognizes the national importance of, and increases protection for, nearly 30 million acres of the most spectacular natural areas in our western states. The purpose of this designation is to conserve, protect and restore nationally significant landscapes that have outstanding cultural, ecological and scientific value for the benefit of current and future generations. The BLM chose to use the Desert Renewable Energy Conservation Plan (DRECP) as a vehicle to propose new additions to the National Conservation Lands. As mentioned, one of the proposed new additions is Fossil Falls. Fossil Falls is clearly deserving of this designation, given its beauty and cultural and scientific value. To let the BLM know you support this proposed designation, you can send an email to the BLM's state director, James Kenna, at jkenna@blm.gov. The BLM will probably make its final decisions about new National Conservation Lands within a few months, so now is the time to tell the BLM you support the proposed addition of Fossil Falls.